With only 24 hours in Singapore before we departed for Indonesia, we decided to live it up at the St.Regis hotel. I had never stayed at a 5-star city hotel before (only on an African safari) and the St.Regis Singapore fit the bill perfectly. From the moment we walked in, we could feel the caring attention of the staff and the exquisite detail given to all the furnishings and decorations in the hotel. Since we really needed to freshen up (long flight), the staff quickly checked us in, took our bags, and then gave us a quick tour of our insanely beautiful room. Magnificent. It really felt first class. Even the thick wooden room door felt bulletproof. As we walked in, we were greeted by wall-to-wall windows, a handsome gold-trimmed writing desk, a chandelier, a heavenly king-sized bed, hand-painted chinoiserie silk wallpaper and a 47-inch flatscreen TV. Then came the bathroom. A massive French marble bathroom with a free-standing bathtub and another TV to watch while having a soak. We also had his-and-her sinks and a separate jet massage shower, which really added to the experience. Basically, the room was exquisite. It’s how I’d imagine the first class suites on the Titanic to look like. It was difficult to leave the room but the hotel also hosts daily one-hour tours of their acquired artwork. We decided to join and it was really interesting to learn about the various pieces, including numerous paintings and sculptures. I really liked the giant candy wrapper, which was created by an artist whose mother wouldn’t let her eat candy as a child. There was also a delightful sculpture by Fernando Botero by the pool and many other pieces by international masters ranging from Pablo Picasso to Marc Chagall as well as Asian artists such as Georgette Chen and Cheong Soo Pieng. If you’re into art, this is the hotel you want to be staying at. Afterwards, we headed to the Astor Bar for their signature Bloody Mary cocktail, which comes in both the original version as well as a spicy version. The drink has been a part of the St.Regis history since it’s debut in 1934. The newer spicy version is quite good if you can handle it, with chilli padi, Chinese old ginger and lemon grass replacing the traditional Worcestershire and Tabasco sauce. We enjoyed both of these tasty drinks while listening to the soft keys of a jazz musician playing the piano. Then came our incredible dinner at La Brezza. We decided to sit on the patio next to the pool, which looked quite elegant at night when all the lights come on. Chef Luca Moioli prepared so much delicious food for us that I could barely move from the table. I just couldn’t turn away any of the dishes. First we had Insalata Di Mare, which consisted of Prawns, Octopus, Scallops, Mussels, Clams and Calamari salad. Next came Zuppa Di Porcini E Pollo, which consisted of Porcini Mushrooms, Slow Roasted Chicken Breast, Mushrooms Espuma, and Hazelnut Powder. By now I was already feeling the bulge and still had four more dishes to go. Luckily I persevered because the next dish was a delicious Ravioli Del Plin. These delicious pockets of pasta came with traditional Piemontese Agnolotti filled with Chicken, Pork and tender Veal, and a natural braising sauce. After a couple more outstanding dishes such as over-stewed cod fish with Braised Onions and Milk Reduction as well as breaded veal chop, the exciting moment of having Tiramisu placed in front of me arrived. I love all types of food but I especially love sweets. I was already fuller than full but somehow I stretched my belly and finished off all the dessert. How could I not? Rich Mascarpone Mousse, Homemade Ladyfinger biscuits, coffee liqueur and cocoa powder; I can’t turn that down. It was difficult to sleep when we got back to the room. Our bodies were focused on digesting all the food so we decided to enjoy the free-standing bathtub. The next morning when we managed to peel ourselves out of the heavenly bed, we made sure to visit the spectacular breakfast buffet before making use of our late checkout to enjoy the room and the refreshing pool. Before leaving to go back to the airport, we decided to try lunch at Yan Ting, which prepares fine Cantonese cuisine. Not surprisingly, we were still full from last nights dinner and the big buffet breakfast. 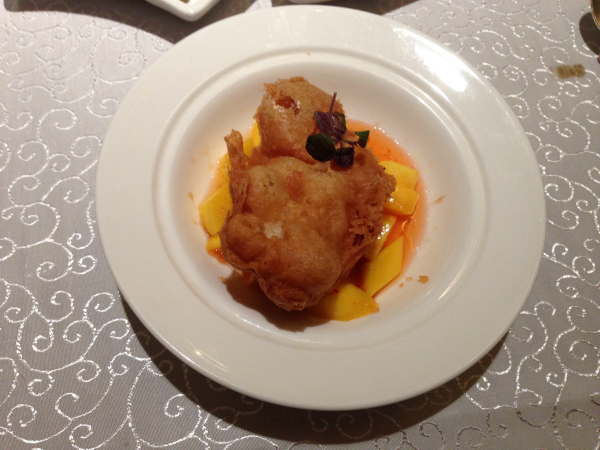 However, I’m glad we stopped because we had one of our favourite dishes of all time; Deep-fried Sea Perch fillet with spicy mango sauce. Imagine the texture of fish n’ chips but with a sweet and spicy flavour. Exquisite. And then came the sad moment when we finally had to say goodbye. Our 24 hours were up and it was time to fly to Indonesia and begin our week-long live-aboard diving trip in Raja Ampat. If you’re looking for a very luxurious hotel in Singapore with an emphasis on art and fine dining, look no further than the St.Regis Singapore. Oh and did I mention that they offer airport transportation in Bentley’s? How cool is that?! All pictures (except for the Ravioli dish) are taken by myself, Matthew G. Bailey. You can find me on Instagram as well at Instagram.com/MatthewGBailey. The Ravioli photo was provided by St.Regis hotel. A big thank you to the St.Regis hotel for inviting us for one night in one of their Grand Deluxe Rooms.